I'm staring at my calendar, wishing mightily that August 28 would hurry up and get here so I can finally hold Mary Who Wrote Frankenstein in my hands! This new book is designed to be read by 5 to 8 year olds (but I won't let that stop me!) 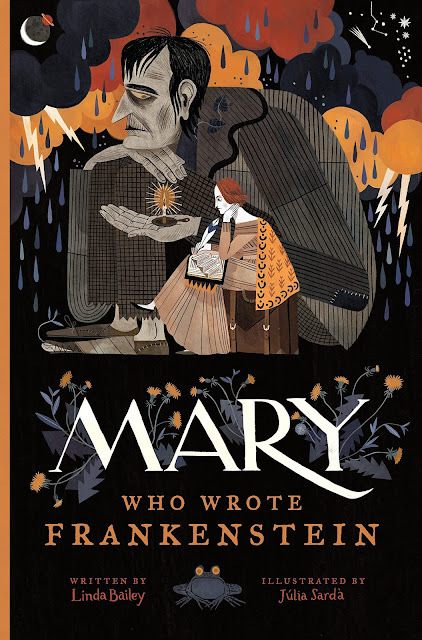 It gently explains to the child reader how Mary was unhappy at home, ran away, moved to Switzerland, and got the idea for Frankenstein on a stormy night. I'm so intrigued to see the pictures inside - the cover looks deliciously dark, and I love the striking use of color. You can pre-order the book on Amazon to be sure it gets to your coffee table as soon as possible! I'm scared to gift this to my niece as it's a bit dark for her parents' liking, and I might get a dramatic text message as a result!